MINA [www.mina.pro] is an international network that promotes cultural and research activities to expand the emerging possibilities of mobile media. MINA aims to explore the opportunities for interaction between people, content and the creative industry within the context of Aotearoa/New Zealand and internationally. Paper proposals should be submitted by the 15th August 2012"
"The increasing ubiquity of digital technology, internet services and location–aware applications in our everyday lives allows for a seamless transitioning between the visible and the invisible infrastructure of cities: road systems, building complexes, information and communication technology and people networks create a buzzing environment that is alive and exciting. Driven by curiosity, initiative and interdisciplinary exchange, the Urban Informatics Research Lab at Queensland University of Technology (QUT) is a transdisciplinary cluster of people working on research and development at the intersection of people, place and technology with a focus on cities, locative media and mobile technology." Fig.1 QUT Urban Informatics researchers Markus Rittenbruch and Mark Bilandzik talk about the role of data in their work with street computing and the Creative Industries Urban Informatics research lab. "There was a flurry of activity in GPS–created art a few years ago. GPS Traces on OpenStreetMap, or GPS drawing, or Waag's Amsterdam RealTime project, collated on this Me–fi post, where the antecedent of forms created from urbanism in Paul Auster's New York Trilogy is noted. This was walking as exhibitionism, the inevitable dovetail of technology and showmanship, venturing forth because we could." 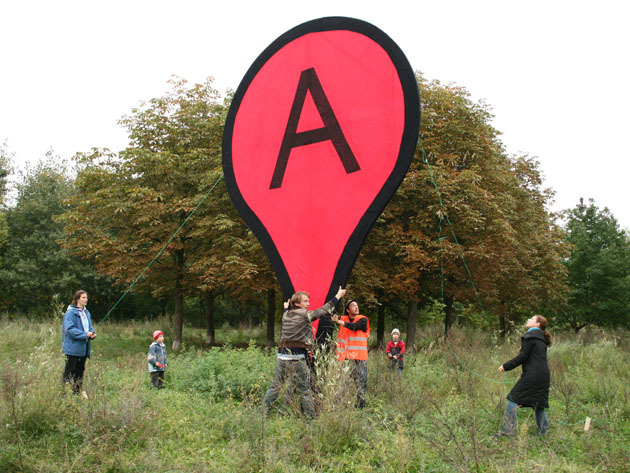 "The project 'Map' is a public space installation questioning the red map markers of the location based search engine Google Maps. The virtual map pins in their specific shape seam to be derived from physical, needle like map markers. But the way they are used in the digital map these markers do underlie additional rules. On one hand the marker and information speech bubble next to it do cast shadows onto the map as if they were physical objects. When the map is switched to satellite mode it seams that they become part of the city. On the other hand these graphical icons of 20 pixel size stay always at the same size on the computer screen. It looks like they sit on a separate layer while ignoring the changing scale factor of the map. In relation to the displayed city map they shrink or grow while the user zooms in or out of the map. The size of the 'life size' rebuilt red marker in physical reality corresponds to the size of a marker in the web interface in maximal zoom factor of the map. Transferred to physical space the map marker questions the relation of the digital information space to every day life public city space. 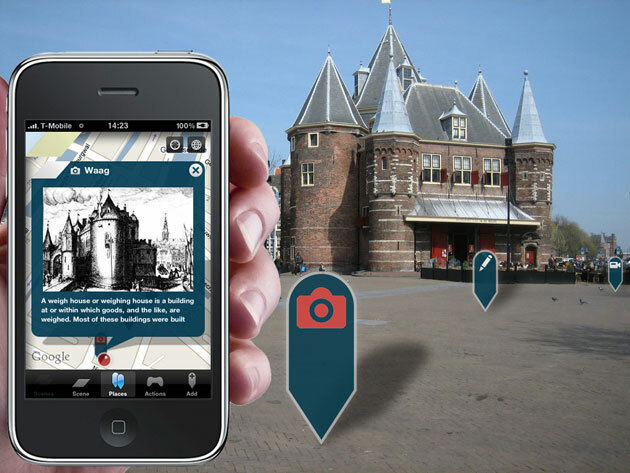 In which way will location related data from the net become 'visible' in physical space? How is reality and truth balanced between the physical world and the net data space?"